Last time we told you how, after experimenting with different solutions, our operations team found the Trello online project management app the best - and most flexible - aid to more agile working. The activity menu is really useful for tracking recent movements in projects on the board. It tells you who has moved what, and - particularly handy if you accidentally drop a card (i.e. the work record of a project) and can’t find it - it tells you where you have put it! Trello lets you share ideas and documents with an invited colleague and, if you don’t read them, it sends you an email to prompt you. Imagine the number of email chains we could reduce by working in this more collaborative way. 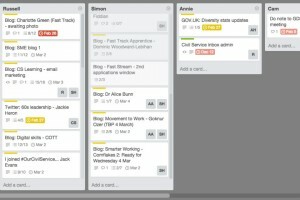 Because Trello is so visual, it really helps you see what projects are happening and when, and who is the lead. 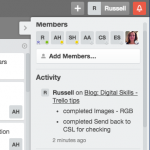 We like that you can access the Trello board wherever you are. If one of us is out visiting our customer service team in Birmingham, he or she can update their project board on the train on the way back. Also, we can easily share the board with our external commercial partners – something we can’t do with documents held on our secure Home Office systems. Using the labels and stickers, you can prioritise work and segment tasks if needed. The calendar option is good, too, as you can see all tasks by their due date and identify potentially busy periods in advance. Lastly, we could make this a seventh tip, but it stands on its own: any project management tool is only as good as the information you put into it - so, keep it up to date! Rather frustratingly the Internet Explorer version we use is too old and so Trello doesn't work! We had similar issues with the Vimeo (online video hosting) account! It doesn't work on Firefox ESR v17.0.11 on GSI either so I think it is a Steria IT policy that won't let us access it! It's great that Civil Service, GCS and the likes advocate new ways of working but what is the point if the infrastructure isn't enabled to allow it (sigh)?! Too right, we're restricted by our systems and infrastructure. Is there a Civil Service team dedicated to resolve this type of issues. I am sent the civil Service News but as my agency is not networked on the Civil Service Network I cannot open up the news articles and so we just get a series of headlines. This cannot be the first time that the Civil Service News is sent to an agency that is not directly linked to the Civil Service IT network and so cannot open the Civil Service news. We are aware of the problems some colleagues face in receiving and opening Civil Service News and using the links within it. And we know how frustrating this must be. The problem is usually the IT arrangements in different departments and agencies, including firewalls, spam filters and other IT security settings (though none of us would argue with the need for this sort of protection in principle). Clearly, some departments need to exercise greater rigour with their cyber security than others. However, we do liaise with departments to try to reach some accommodation so that, for example, CS News is not treated as spam, or identified as a threat to the integrity of their systems. Where this isn't possible, we usually recommend that colleagues who find links blocked should cut and paste them into another web browser (Firefox). Local IT teams will be able to assist anyone who needs help with this. Failing this, the majority of items in the newsletter link to material on the Civil Service blog platform. If you go to http://www.civilservice.blog.gov.uk, you should find most, if not all, the pieces advertised in each CS News edition near the top of the home page, or you can 'search' them. Having read this article i was really interested to see how Trello could support our local DOSN work plan but alas as others have stated my access to the site was blocked. Is there any hope this may change? I currently have JIRA access for a project I'm working on and this is in the Kanban way of working. It's great actually and could really help with other less formal projects. I'm going to check out whether my access can be maintained after the project has come to an end.